The south cross is also known as the cross of Saints Patrick and Columba because of the inscription on its base: (upper part of the east face) PATRICII ET COLUMBE CR v. The ringed cross (H 2.7m; Wth 1.25m) has a shaft (dims 0.51m x 0.29m) and stands on a pyramidal base (dims at base 1.45m x 1.3m; H 0.6m) which has a hunting scene on the E face. The worn edges of the cross have roll mouldings, but no frames separate the panels. This part of the cross represents Adam and Eve on the left and Caen and Abel on the right side. They also appear in the same configuration on the Muiredach's Cross. It's easy to recognize them because they are often represented with the tree of life. Caen and Abel were the children of Adam and Eve. Caen is the first person who was born on earth and also the first murderer because he killed his brother Abel who became the first person to die. The cause of the conflict was jealousy. Caen offers one part of his toil results for God and Abel offers the first births of his herd. God pay attention to the Abel's present so Caen became jealous of his brother and finally kill him. This panel shows the children in the furnace. Chapter 3 of the book of Daniel tells the story of Hananiah(Shadrach), Mishael (Meshach), and Azariah (Abednego). You can discover it in the video just below. King Nebuchadnezzar constructed a golden cult image of himself, which he orders the populace to worship. Hananiah, Mishael, and Azariah defy the king's order, refusing to worship anyone but God alone. Nebuchadnezzar, in a fit of rage, orders that the three children be thrown in a furnace. Inside the furnace, Azariah prays for the forgiveness of his sins and those of his people, asking God to demonstrate his power to the Babylonians. They are delivered from the fire by an angel who makes the flames feel like a cool breeze over dew. Seen in the furnace walking with a fourth individual unscathed and praising God, the three children emerge. Nebuchadnezzar then orders the people to worship their God instead of the idol. 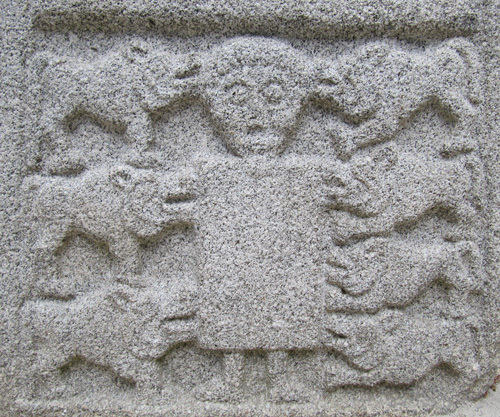 Daniel in the lion's den is a common representation on the high crosses of Ireland as you can see it on the Moone High Cross. The king Darius used to entrust his servitor Daniel a lot of responsibilities. Some people in the court didn't agree with that and waited for a fault of Daniel. They convinced the king to sign an edit which oblige the folk to pray only for the king during 30 days. During this period, Daniel continued to pray God and so he had been denounced by his detractors to the king. So Darius had to follow his law and put Daniel in the lions'den. The next day, Daniel was still alive because God had decided to save him and had impeded the lions' mouths. Finally, Darius took the detractors, their wife and children and put them in the lions'den. Then, he declared that Daniel's God is powerful and that everybody had to pray for him. Daniel in the lions'den by Pierre Paul Rubens (around 1615). One of the arm is Saint Paul and Anthony, one other represents David playing a harp and the last one is the sacrifice of Isaac. Saint Anthony famously undertook a difficult journey to visit St Paul the Hermit and learn from his wisdom. While he was visiting, the two were fed by a raven that brought one loaf of bread for each of them. On a second visit, Saint Anthony found the old hermit dead. Lacking o shovel to bury him, he managed to get him into the ground with the help of some passing lions. The raven carrying bread is the attribute of Saint Paul. Saint Anthony is usually portrayed as a venerable old man with a long beard wearing a monk's habit with a T printed on the left side of the hood, holding a book and staff in one hand and a bell in the other, and having a pig at his feet. The panel in the middle of this side represents the crucifixion of the Christ. The two people below the Christ probably are Stephaton who offers Jesus vinegar on a pole on the left and on the right, Longinus who stabs Jesus with a lance. The two little boys above the Christ could be angels who symbolize the presence of god. The head of the cross represents the Christ in majesty. Starting in the 4th century, the Roman church adopted images of the regnant Christ as sitting on a throne flanked by saints (usually Peter and Paul). This development is related to the genesis, also in the 4th century, of the TraditioLegis iconographic type, in which the enthroned Christ entrusts the Law to Paul and the "keys of the kingdom" to Peter. He is also enthroned in Last Judgment images from at least the 6th century. After the 12th century it became less common in the West, where images of the Madonna Enthroned gained popularity. Saints Peter and Paul are labelled with their Latin names. Christ's label comprises the Greek abbreviations for "Jesus" and "Christ." The book on his knee is a common feature of images of this type. Saint Patrick and Saint Columba. These tow saints are part of the three chief saints of Ireland. His attributes are the monk's robs, the Celtic tonsure and the crosier. 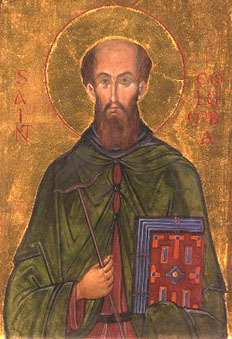 Saint Columba was a 6th century Irish abbot and missionary. He was born at Garten in Donegall to a noble family before entering the monastic school of Movilleunder Saint Finnian. Having completed his training, he travelled to Leinster and then later to the monastery of Clonard where he was likely ordained priest. When a pestilence devastated the country in 543, the monks whispersed and Columba spent 15 years traversing in Ireland founding several important monasteries, including Derry in 546. Sometime around 560, he became involved in a dispute with Saint Finnian over a psalter. Columba had copied a psalter and believed he had the right to keep it, Saint Finnian did not. In 563, Columba, with twelve companions, left for Scotland. The reasons given for this departure vary but it's probable that he was involved in encouraging clan warfare against King Diarmait in 561, with some connection to the psalter dispute. On the island of Iona, he founded the famous Abbey, a centre for Celtic Christianity. Iona became a base for missionary work amongst the Northern Picts. Adomnán, 8th century abbot of Iona and biographer of St Patrick, said of Columba: "He was angelic in appearance, graceful in speech, holy in work". He is the patron Saint of Derry. Saint Patrick brings the Christianism in Ireland, he is often represented with a shamrock. 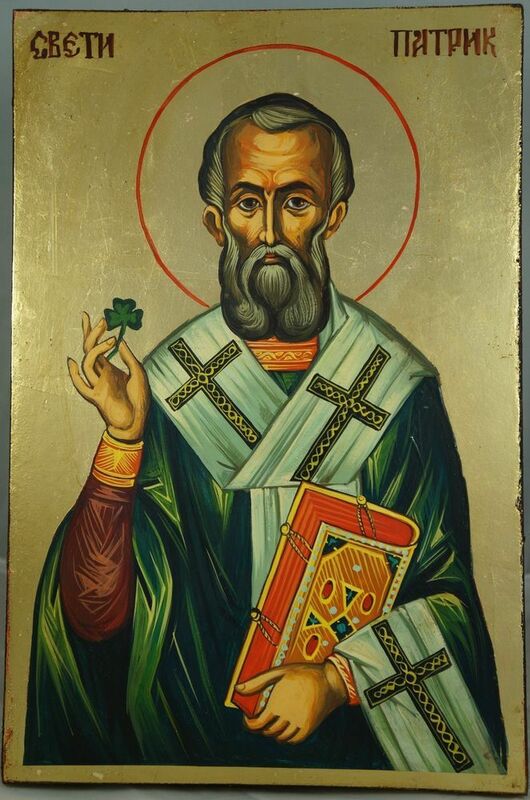 Saint Patrick used to present the tree parts of God with the tree sheets of a shamrock, like a parabola. For the Irish people, 3 was a significant number in the Irish mythology so it helped Saint Patrick to convert the folks. He is becoming a patriotic symbol and the Saint Patrick's Day is now famous in the entire world.